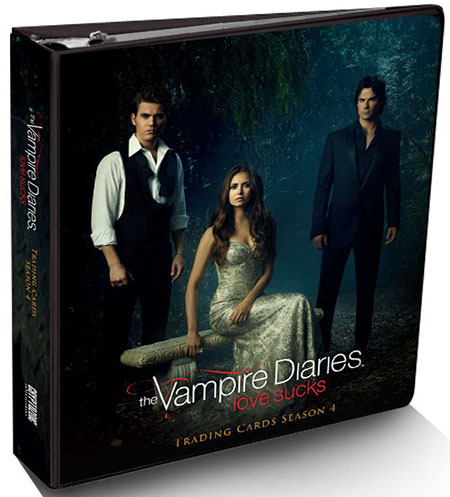 2016 Cryptozoic Vampire Diaries Season 4 trading cards continue with the brooding romance and handsome mythology the show is known for. And as far as cards go, there is a sense of familiarity as well. 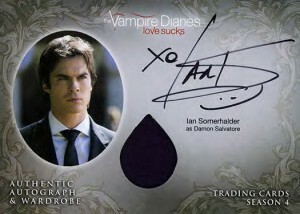 As with past releases, each box comes with both an autograph and a costume card. 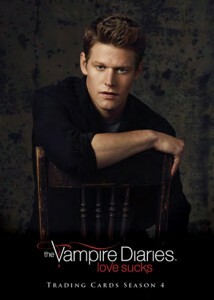 It has been a while since The Vampire Diaries last had a set. Season 3 released back in March, 2014. 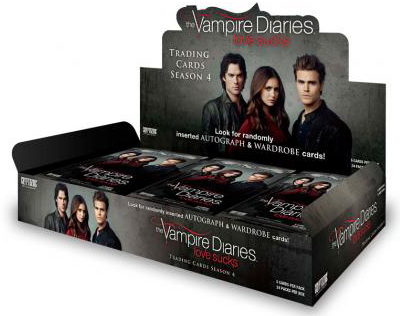 As far as the base set goes, 2016 Cryptozoic Vampire Diaries Season 4 consists of 72 cards. All are based on the episodes themselves, retelling key events, romances, conflicts and more. Base cards also have Printing Plates. Each has four different one-of-a-kind cards based on the four colors of the printing process: blue, cyan, magenta and yellow. There are also much more common Silver Foil Board parallels for both base cards and basic inserts. These fall at a combined 1:4 packs. 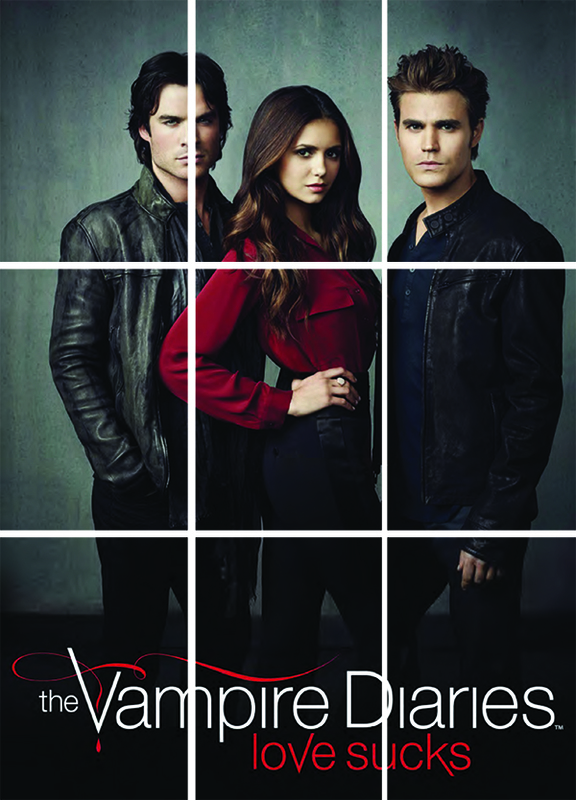 The 2016 Cryptozoic Vampire Diaries Season 4 Autographs checklist is broken up into a couple of parts. The first are basic autographs and have more than 20 signers. 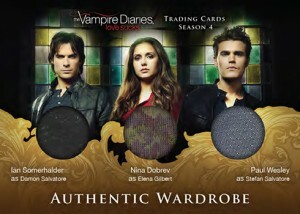 The set also has five Autographed Wardrobe cards. 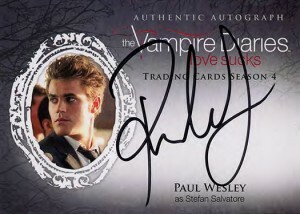 Paul Wesley and Ian Somerhalder both see their signatures return. Nina Dobrev did not sign this time around. 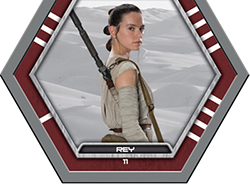 Wardrobe Cards come with as many as three swatches from costumes. That said, dual- and triple-swatch cards are tough to pull. 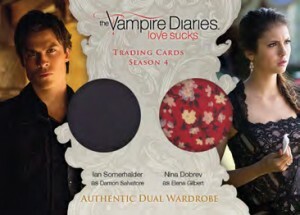 Perhaps the biggest difference of this release versus previous sets of Vampire Diaries trading cards is found in the basic inserts. Previously, there weren’t many of them, both in quantity and style. For example, Season 3 has just four basic inserts per box spread across two sets. 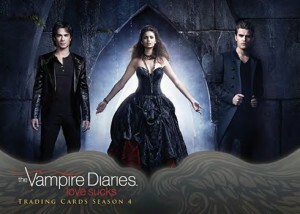 Season 4 has three different basic insert sets, each landing 1:3 packs. Insert themes are a nine-card puzzle, Portraits and Studio cards. A custom binder is available on its own. 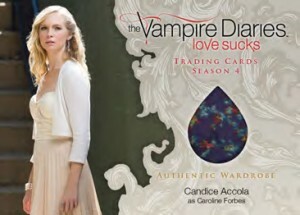 It comes with an exclusive Wardrobe Card of a Mystic Falls Graduation Robe. 38 May I Have This Dance? 23 cards. All signed cards 1:24 packs combined. 1 card. 25 copies produced. Ryan- I would love to see more box busters videos on sports cards- and LESS vampire diaries/ Marilyn Manson articles. I realize that all cards are covered, but the last month has had very few videos on sports cards, and a lot of non-sport cards on the specialty market. Thanks for the feedback. Box breaks are great and they post them when they can. I don’t work from the same place so I’m not coordinating those or when they’re posted — they seem to come in batches. We’re trying to cover lots of ground. Some days/weeks there’s a whole lot in one area at once and little to nothing in others. We try to spread it out as much as possible but sometimes it doesn’t work out that way.